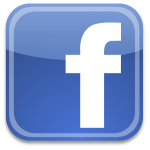 Keep up with our latest news and community shares on our Facebook page. 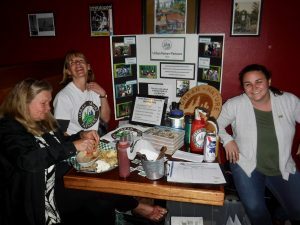 Listen to our KBOO radio interview from 4/10/19! Spring 2019: After 5 years, UNP-PDX is finally an independent 501(c)(3), residing in a permanent office space at 2937 NE Glisan! Huge thanks to our first Board of Directors and Advisory Committee that helped make it happen. We’re also grateful to the Collins Foundation and Metro’s North Portland Community Works Vanport Legacy grant program for providing funds for our transition costs, and to the Fully company for donating our awesome ergonomic desks and chairs. December 21, 2018: We’re recruiting a part-time Administrative Intern for January- June 2019. This $10/hour position also qualifies for college credit, and is a great opportunity to get ground floor experience in grassroots nonprofit management. Spanish speakers are encouraged to apply. Learn more and apply HERE. 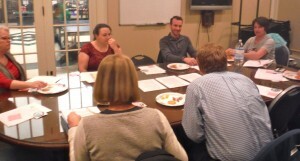 We’re also getting ready to transition our Administrative Committee to a Board of Directors in February 2019, and are seeking new members. A diversity of candidates in gender identity, age, and racial and ethnic background are desired; and skills in volunteer management, youth support, fiscal and fundraising, data management, and nonprofit startup tasks are especially needed. Contribute your skills behind the scenes to a great cause! Advisors and non-board member volunteers are also welcome. Learn more and apply HERE, and plan to attend our informational session on January 6. 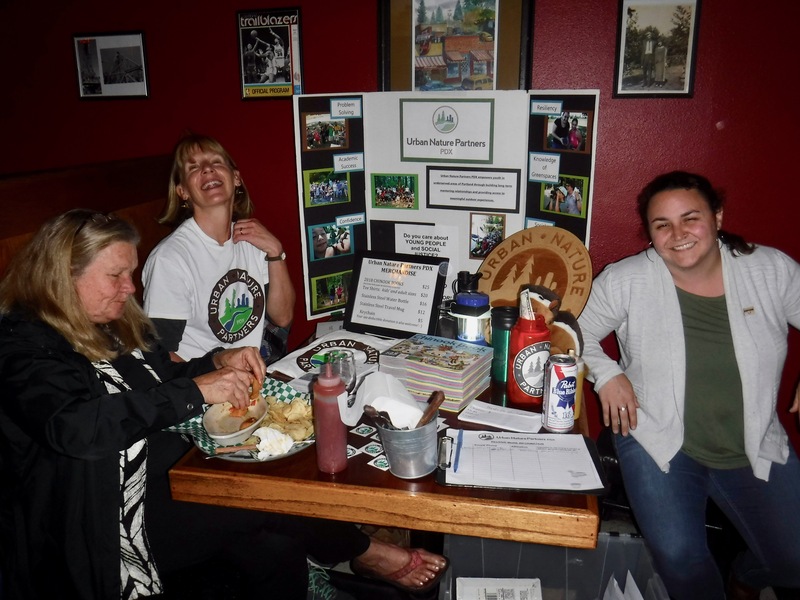 July 20, 2018: We’re thrilled to have hosted our first Summer Celebration at Lagunitas Community Room, and to be planning a second benefit there on October 11th! Check out the fun, and we’ll look forward to seeing you again soon. 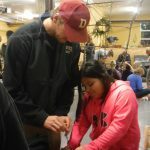 March 2, 2018: Recruitment season is officially open for our 6th cohort of outdoor mentor/youth pairs! Learn more and take the first step in the application process HERE by APRIL 15th. 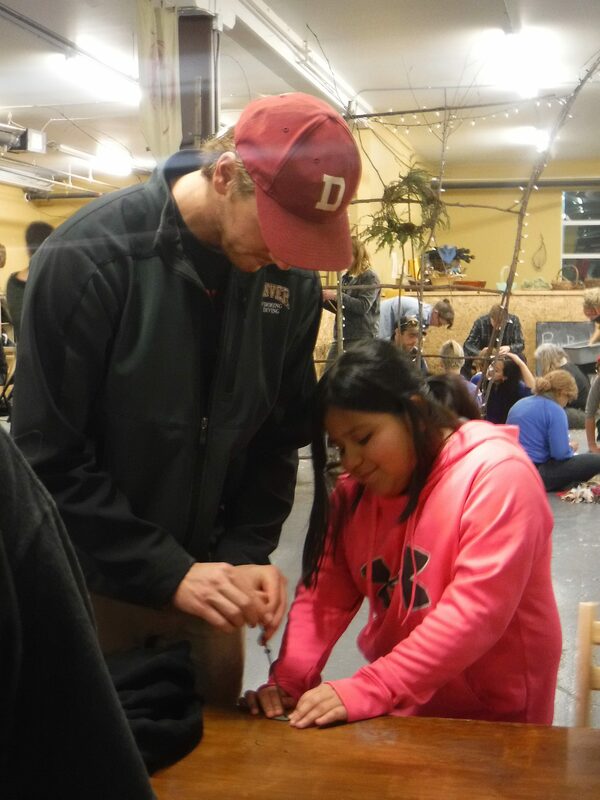 We’re finishing up our first year of partnering with Big Brothers Big Sisters in the Outdoor Explorers Program! 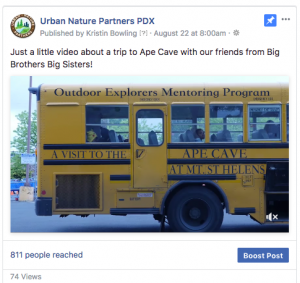 Please enjoy this video of our May trip to Ape Caves. 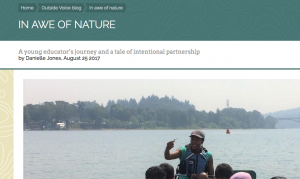 UNP-PDX intern and Administrative Committee volunteer Danielle Jones shares her experience building equity outdoors with youth in the Intertwine’s Outside Voice: In Awe of Nature. 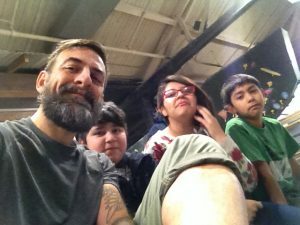 UNP is proud to be one of the youth partners helping the Intertwine design Daycations– awesome outdoor day trips you can take in the Portland metro area, which is our specialty. Check it out HERE. A huge thank you to East Multnomah Soil & Water Conservation District for a second Partners in Conservation Grant, and to the Gray Family Foundation for a second Community Field Trips grant. Thanks to ongoing support from these two funders, we’ll be able to provide more awesome group activities, summer camp scholarships, and outdoor gear to our youth and families, as well as great training and support for our mentors, into summer 2017. Thanks so much for investing in our future! We’re so excited to have 7 inaugural members of our new Administrative Committee on board to help support and guide the future of UNP-PDX! We’re still in need of 2 experienced volunteers to help us with Fundraising. Apply, or send our info to someone you know, here. 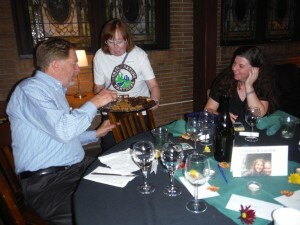 Our first BENEFIT DINNER & CELEBRATION on OCTOBER 11 at TaborSpace was a smashing success! 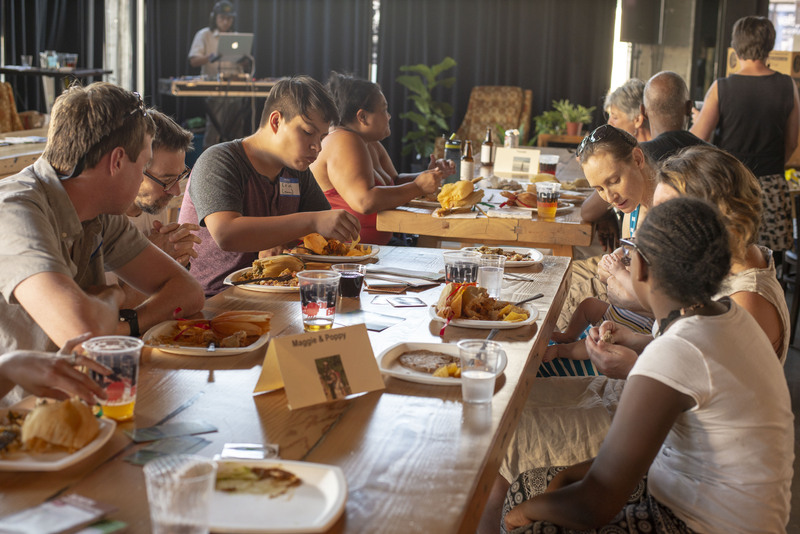 Thanks to generous donors, our youth, families, and mentors enjoyed an evening of awesome food and live music alongside UNP supporters, and we raised over $2,100. Thanks so much to our tireless volunteers who made it happen!